The gribble, Limnoria quadripunctata, is one of the only animals that can digest wood. Scientists from the University of York, University of Portsmouth and the National Renewable Energy Laboratory have discovered an enzyme produced by gribbles, tiny marine wood borers, that can help turn wood based biomass into biofuel. 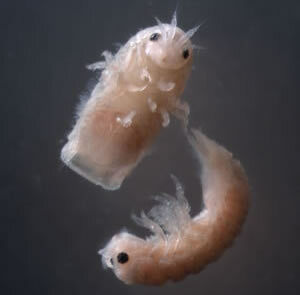 Unlike termites that have microbes inside their guts to help process wood they digest, gribbles have a sterile gut which means that these tiny animals process the wood themselves through an enzyme. Scientists have now isolated this enzyme and once its structure is studied and can be commercially reproduced, it can help create sustainable liquid biofuels. Biofuels are sustainable, efficient, and renewable fuels that are processed from biological material called biomass. Biomass are organic material from living or recently living organisms. Biofuels are derived from biological carbon fixation which is the reduction of carbon dioxide or inorganic carbon to organic compounds by living organisms. Biofuels can come from different sources such as agricultural crops, animal products, plant material or from living organisms like algae. Scientists have discovered a new enzyme that could prove an important step in the quest to turn waste (such as paper, scrap wood and straw) into liquid fuel. To do this they turned to the destructive power of tiny marine wood-borers called 'gribble', which have been known to destroy seaside piers. Using advanced biochemical analysis and X-ray imaging techniques, researchers from the University of York, University of Portsmouth and the National Renewable Energy Laboratory in the USA have determined the structure and function of a key enzyme used by gribble to break down wood. The findings, published in PNAS, will help the researchers to reproduce the enzymes effects on an industrial scale in a bid to create sustainable liquid biofuels. To create liquid fuel from woody biomass, such as wood and straw, the polysaccharides (sugar polymers) that make up the bulk of these materials have to be broken down into simple sugars. These are then fermented to produce liquid biofuels. This is a difficult process and making biofuels in this way is currently too expensive. To find more effective and cheaper ways of converting wood to liquid fuel, scientists are studying organisms that can break down wood in hope of developing industrial processes to do the same. Gribble are of interest as they are voracious consumers of wood and have all the enzymes needed for its digestion. The enzymes attach to a long chain of complex sugars and chop off small soluble molecules that can be easily digested or fermented. The researchers identified a cellulase (an enzyme that converts cellulose into glucose) from gribble that has some unusual properties and used the latest imaging technology to understand more about it. The research team leader, Professor Simon McQueen-Mason, from the Centre for Novel Agricultural Products at the University of York, explains: "Enzymes are proteins that serve as catalysts, in this case one that degrades cellulose. Their function is determined by their three-dimensional shape, but these are tiny entities that cannot be seen with high power microscopes. Instead, we make crystals of the proteins, where millions of copies of the protein are arrayed in the same orientation." Dr John McGeehan, a structural biologist from the University of Portsmouth team, said: "Once we succeeded in the tricky task of making crystals of the enzyme, we transported them to the Diamond Light Source, the UK's national synchrotron science facility. Rather than magnify the enzyme with a lens as in a standard microscope, we fired an intense beam of X-rays at the crystals to generate a series of images that can be transformed into a 3D model. The Diamond synchrotron produced such good data that we could visualise the position of every single atom in the enzyme. Our US colleagues then used powerful supercomputers, called Kraken and Red Mesa, to model the enzyme in action. Together these results help to reveal how the cellulose chains are digested into glucose." This information will help the researchers to design more robust enzymes for industrial applications. While similar cellulases have been found in wood-degrading fungi, the enzyme from gribble shows some important differences. In particular, the gribble cellulase is extremely resistant to aggressive chemical environments and can work in conditions seven times saltier than sea water. Being robust in difficult environments means that the enzymes can last much longer when working under industrial conditions and so less enzyme will be needed. Professor McQueen-Mason explained: "This is the first functionally characterised animal enzyme of this type and provides us with a previously undiscovered picture of how they work. "While this enzyme looks superficially similar to equivalent ones from fungi, closer inspection highlights structural differences that give it special features, for example, the enzyme has an extremely acidic surface and we believe that this is one of the features that contributes to its robustness." The ultimate aim is to reproduce the effect of this enzyme on an industrial scale. Rather than trying to get the cellulase from gribble, the team have transferred the genetic blueprint of this enzyme to an industrial microbe that can produce it in large quantities, in the same way that enzymes for biological washing detergents are made. By doing this they hope to cut the costs of turning woody materials into biofuels. Professor McQueen-Mason added: "The robust nature of the enzymes makes it compatible for use in conjunction with sea water, which would lower the costs of processing. Lowering the cost of enzymes is seen as critical for making biofuels from woody materials cost effective. Its robustness would also give the enzymes a longer working life and allow it to be recovered and re-used during processing." The work is part of the BBSRC Sustainable Bioenergy Centre (BSBEC), a £24M investment that brings together six world-class research programmes to develop the UK's bioenergy research capacity. Funding from a BBSRC USA Partnering Award was instrumental in forming a highly synergistic collaboration with the US DOE funded research team at NREL. Douglas Kell, BBSRC's Chief Executive, said: "This is an exciting step in realising the potential of these important enzymes. If we can harness them effectively, waste materials could be used to make sustainable fuels. It's a double bonus; avoiding competition with land for food production as well as utilising unused materials from timber and agricultural industries."